In order to better serve our Catholic High School teachers teachers the Office of Religious Education has a variety of materials that correspond to the Didache Series published by The Midwest Theological Forum. In addition to the Religious Education Curriculum for Catholic High School, the Office of Religious Education had developed a series of illustrated Powerpoints that correspond to the curriculum and the chapters of the Didache Series. In order to make these materials more usable for teachers they can be downloaded, modified, and commented upon. While keeping the required lesson objectives, all teachers are free to download and modify the materials to better fit their classroom needs. 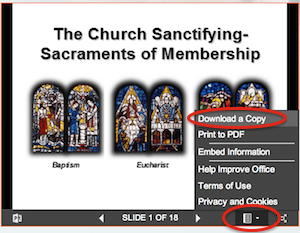 To download simply click on the menu icon at the bottom of any Word document or PowerPoint presentation. At the bottom of each webpage is a place for teachers to leave their comments about how these materials can be improved or better carried out in the classroom. For example, if you know of another teaching illustration, video, or activity that corresponds with the lesson, please share it with the rest of us!